Warning! Spoilers below for the season 3 finale of The Flash! Last season on The Flash, Savitar, aka warped Barry remnant (Grant Gustin), was finally defeated without Iris (Candice Patton) dying because HR (Tom Cavanagh) sacrificed himself instead. There was a giant fight – Killer Frost (Danielle Panabaker) ended up saving Cisco (Carlos Valdes), and Iris took out Savitar. The speed force needed a sacrifice and showed up as Barry’s mother, insisting he needed to go love there or worlds would be destroyed. Julian (Tom Felton) made a cure but Caitlin didn’t take it, although she was on a path to redemption. The Flash 4.1 “The Flash Reborn” review: Iris narrates the opening… 6 months have passed. 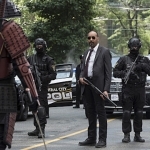 Iris, Joe (Jesse L. Martin) , Kid Flash (Keiynan Lonsdale), and Vibe chase Peek-a-Boo and catch her. But their numbers aren’t good. Cisco is really upset. Family dinner includes Cecile (Danielle Nicolet) who is moving in. Joe tries to talk to Iris who is trying to be strong because Barry would have wanted her to. Something new – a deadly samurai wants the Flash “or else your city falls.” He demonstrates his magic sword powers. Cisco wants to free Barry. He’s been working on it with help from Felicity, Harry, etc. Iris is against it, but Cisco doesn’t understand. He visits a bar where Caitlin is working. 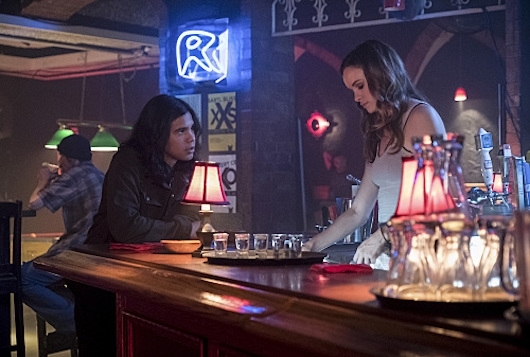 She’s just Caitlin, and Cisco needs her help to get him out. They hop to it against Iris’s wishes and fail… or did it? Somewhere far away naked Barry comes out of the speed force and faints. Iris is livid. But they get a call. Barry is crazy. He is spouting nonsense… “the stars!” Caitlin has theories, but they cannot figure it out. He is totally “A Beautiful Mind,” speeding around uncontrollably forcing Caitlin to blast him with the cold gun. Wally tries to make pretend, but the Samurai is not fooled. Cisco thinks he cracked the code, but when “this house is bitchin'” is the answer, he knows it failed. He is so hard on himself, and Caitlin comforts him. “I did it because I miss my friend.” Joe gives Iris one of his dad talks – all about faith. Samurai’s deadline has come. There is a standoff, and Iris gives herself to him, having “faith” that Barry will save her. Joe runs to him frantic, “Iris is gonna die!” Barry busts out of the cell taking the suit with him and saves her… from a robot. He’s back, baby! And super positive, as well. The gang is all back together, including Caitlin, who still has some frosty tendencies. I really liked the “crazy” aspect of Barry’s return. It makes sense that the speed force, outside of time and space would make someone go bonkers. The struggle between all the people who love Barry, each doing what he/she thinks is best made for some good scenes. Cisco was less himself than usual, but that is to be expected given the enormity of his loss. As Barry returned to normal, so did Cisco. I know that Iris is the practical one, but it took too long for her to find her faith. I would have been right there with Cisco looking for the speedforce loophole. Very pleased that Barry was back within the first episode. The Flash is not a show to drag things out. Welcome Neil Sandilands! We look forward to your villainy! The Flash airs Tuesday nights at 8:00pm ET on The CW. 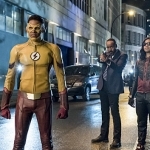 COMING HOME — With Barry (Grant Gustin) in the speed force, Iris (Candice Patton), Kid Flash (Keiynan Lonsdale), Joe (Jesse L. Martin) and Vibe (Carlos Valdes) have taken over protecting Central City. However, when a powerful armored villain threatens to level the city if The Flash doesn’t appear, Cisco makes a risky decision to break Barry out of the speed force. However, the Barry that comes out isn’t the same Barry that went in. Glen Winter directed the episode with story by Andrew Kreisberg and teleplay by Todd Helbing & Eric Wallace (#401). Original airdate 10/10/2017.